LibrePlanet 2015: Free Software Everywhere has come to a close. The FSF staff are back at the office, unpacking, sifting through photos and videos, and gathering our thoughts on another awesome gathering of free software enthusiasts. With approximately 350 people in attendance, we kept pace with last year—with a few improvements. In particular, our tech team did a fantastic job improving our video feeds, with peak usage at around 300 simultaneous views. 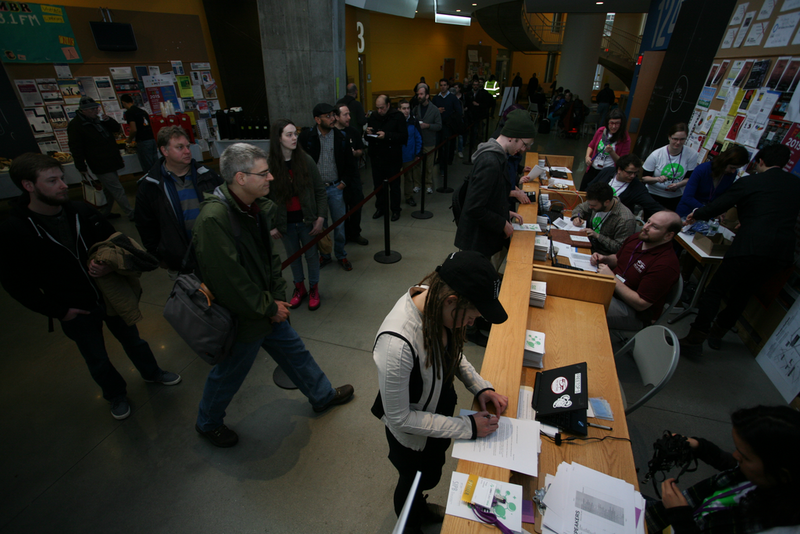 We also worked hard to streamline the registration process, reducing time spent waiting in the registration line before Richard Stallman's Saturday morning keynote, with few hiccups. Let's take a look at some more highlights. Read our post about day one of the conference and the election of our newest board member, Kat Walsh. FSF board member Benjamin Mako Hill kicked off Sunday morning with an examination of how the free software community has progressed with two major goals: access and empowerment. He argued that empowerment has a long way to go, and offered some suggestions for next steps. This year, we had over 40 speakers, and like last year, about 40% were women. Karen Sandler, in her new role as executive director of the Software Freedom Conservancy, gave her third LibrePlanet keynote to close the conference, expanding on the recent suit brought by Christoph Hellwig, contributor to the kernel Linux, against VMWare for violating the GPL by not releasing the source code for the version of the operating system kernel they distribute with their ESXi software. Read our statement of support here. Sunday's talks explored the possibilities for free software: Jennie Rose Halperin of Safari looked at free software's potential role in cultural heritage organizations, Brett Smith discussed Arvados, a free software platform for big data science, Free Software Award-winner Sébastien Jodogne gave one of several talks on free software's role in medicine, and other talks looked at free software possibilities for universities and journalism, as well as examining threats to free software, gathering the community for strategy sessions, and offering practical training. Our sustained partnership with MIT's Student Information Processing Board once again helped make LibrePlanet great, thanks to the energy and enthusiasm of SIPB's membership. We on the FSF staff owe many thanks to our tireless volunteers, without whom LibrePlanet couldn't possibly be as large or well-run as it is. Thank GNU to Leah Rowe of Gluglug and Libreboot, rsiddharth, Janith Perera, Sharon Ramage, Anke Nowottne, Mo Moulton, Diane Williams, Elyes Ighilaza, Brendan Kidwell, Rimma Shakhbatyan, Andy Zimolzak, Herm Pena, Taylor Gunnoe, Tanya Balyan, Devin Ulibarri, Ryan Desfosses, Geoffrey Jenkins, Martin Yim, Daniel Felix, Evan Mulvaney, Veronika Alexander, Patrick Engelman, Dan Fitzmartin, Ian Denhardt, John Saylor, Ben Cook, Sunil Kumar, Tim Jordan, Alice Alisme, Sunil Kumar, Julian Daich, Lizz van Allen, Kendra Moyer, Loren Chen, Helen Jiang, Max Dunitz, Mariah Villareal, Shayna Cummings, Matthew Coleman, Weston Cooke, and George Chriss. If you're interested in volunteering next year (you'll receive gratis admission and a t-shirt), please contact resources@fsf.org. If you attended LibrePlanet and haven't filled out our feedback survey yet, please take a few minutes to do so. LibrePlanet is for you, and your ideas, compliments, and criticisms will help us make the next LibrePlanet even more productive, welcoming, and fun. If you missed a session, or want to share them with friends, keep an eye on the LibrePlanet video archive (powered by GNU MediaGoblin). We're working hard to get videos posted within a week or two, and we'll inform you when they're available. We had a great group of sponsors this year and we are looking to build on that for next year. If your company would like to support LibrePlanet, please contact us any time at donate@fsf.org. With the renewed energy that comes from spending a great weekend with the free software community, we're excited about the year ahead. Mark your calendars for October 3, when we'll celebrate our 30th anniversary, with events here in the Boston area and around the world. If you'd like us to let you know when registration opens for LibrePlanet 2016, join the announcements list (anchored at the top of the 2015 conference page) today. Remember that becoming an FSF member gets you gratis admission to the conference, and bragging rights for supporting the FSF's work year-round.